Print is our business so it may seem odd that we want to help your organization reduce the use of paper, but our commitment to prudent environmental conservation goes before our economic interest. We realize the manufacture and use of office products has an impact on the environment, from energy consumption and paper use to the chemicals potentially released during disposal of equipment and supplies. Our Green Initiative combines our own internal efforts with the utilization of programs, services and products of the manufacturers we represent. As part of our Green Initiative we reduce our energy consumption by using EnergyStar compliant products, turning off lights and equipment in unoccupied areas and at the end of the business day, reducing the use of paper by communicating documents electronically, and reducing travel by utilizing the internet for meetings, software service calls and training. The products we sell and service are all ENERGY STAR qualified products with advanced technologies that use 10 to 50 percent less energy than the standard products in their categories. Not only that, four years ago we replaced our entire fleet of service vehicles with nearly two-dozen hybrid automobiles, significantly reducing our dependence on fossil fuels. Since then, we have added two CNG trucks to our delivery fleet, taking advantage of domestic energy and using a cleaner burning fuel. In practical terms, "Reuse" means finding new uses for older items and sharing with others what we no longer need for ourselves. We reuse packaging materials, pallets and boxes we receive from our vendors, reuse printed paper produced in the office for notes and packaging materials, collect ink cartridges for refill and resell, and donate refurbished equipment. Recycling converts used items back into raw materials, which are then used in making new products. Recycle comes third, after Reduce and Reuse, because recycling requires new resources for transportation and the manufacturing process. Nevertheless, the economic and environmental benefits are significant. 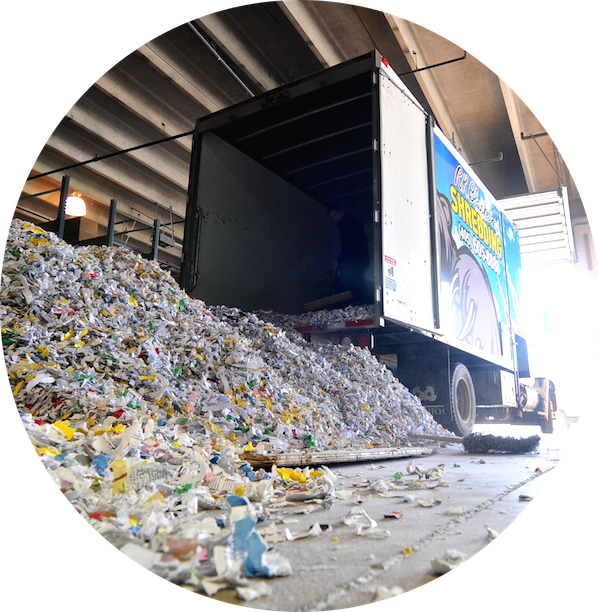 We recycle our aluminum cans, plastic bottles, excess shipping cartons and shredded paper. In fact, speaking of shredded paper, did you know that according to the University of Southern Indiana, each ton (2,000 lbs) of recycled paper saves 17 trees, 380 gallons of oil, three cubic yards of landfill space, 4,000 kilowatts of energy and 7,000 gallons of water? This is why, along with some other reasons, four years ago we added mobile document destruction to our list of business services. Since then, R.K. Black Shredding has shredded and recycled nearly 2,000 tons of paper from our client businesses. If you do the math, that's almost 34,000 trees. You can see a forest for all the trees saved! Download or view our infographic detailing what resources our shredding division has saved in nearly four years of business. In addition, R.K. Black promotes the Toner / Ink Recycling Programs of our vendors that enables our clients to recycle used copier, printer and MFP toner cartridges at no cost. What can just one company do? Care enough to make a difference . . . join us in our efforts to live and work responsibly for a greener tomorrow!